Two former Quinn Group executives are said to be "very reluctant" witnesses in a High Court action following "threats and actions of violence towards them". Both Dara O’Reilly and Liam McCaffrey have been joined by the Irish Bank Resolution Corporation (IBRC) as third parties in proceedings it and liquidator Kieran Wallace are facing from the children of former billionaire Sean Quinn. The children dispute liability for hundreds of million euros in loans given to Quinn companies by IBRC’s predecessor, Anglo Irish Bank. Mr O’Reilly and Mr McCaffrey now work as chief financial officer and chief executive respectively for Quinn Industrial Holdings, a company made up of elements of the former Quinn empire. Their barrister Ross Gorman told the High Court they were very reluctant witnesses. He said Mr O’Reilly’s car had been burnt out before Christmas and boiling water was thrown in his face last month. The barrister told Mr Justice Garrett Simons his clients accept they had been agents of Quinn Group and for Sean Quinn. However, they say they had not been agents for the five Quinn children, who owned the shares in the group. Mr Gorman told the court Mr O’Reilly had said in a statement he received instructions from Sean Quinn and that he understood Mr Quinn was authorised to act on behalf of his children. The barrister said no allegation had been made by IBRC that either of his clients had done anything wrong. 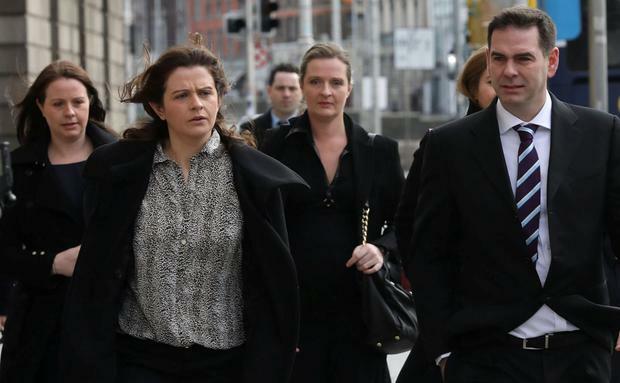 The case is due to hear evidence of how the children, Sean Jr, Ciara, Colette, Brenda and Aoife Quinn, came to sign guarantees and share pledges related to loans for hundreds of millions of euro from Anglo in 2007 and 2008. Some €2.34bn was loaned to Quinn Group companies to fund losses arising from their father’s disastrous speculation on contracts for difference, financial instruments which allow a person to speculate on the performance of a share without buying it. The children claim they should not be held liable for loans of €415m and that they were unduly influenced by their father, who they say controlled the business even though they were the owners. They also alleged Anglo behaved in a "morally reprehensible" manner towards them when they signed loan guarantees, and that they were never advised by the bank to take independent legal advice. The claims are denied by IBRC, whose counsel Paul Gallagher SC said the children were "attempting to rewrite history". Mr Gallagher said it was clear the children had signed and authorised loan guarantees and share pledges. In court yesterday, he went through various transactions involving the children, which he said clearly demonstrated their deep involvement in the running of the business. He told the court the IBRC had identified "a multitude of documents" relating to borrowings, guarantees, shareholdings, pledges, charges and powers of attorney. "These were people used to dealing in enormously large transactions and giving people power of attorney," said Mr Gallagher. "They knew what these things were." The barrister also queried claims the children had modest lifestyles. He said that far from having no assets, the children owned the home where their parents lived and had been able to give them gifts worth €12m. The first of the children to give evidence, Brenda Quinn, is due to take the stand tomorrow. The case is expected to last up to six months.